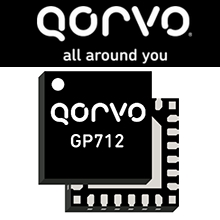 Qorvo has announced that its GP712 System-on-Chip is the first multi-channel Internet of Things (IoT) transceiver in the industry to be certified for the Thread protocol. With concurrent support for Thread and ZigBee on different RF channels, the GP712 enables designers to use a single transceiver on their gateway products to simultaneously serve both IEEE802.15.4 implementations. The GP712 incorporates Qorvo’s best-in-class range and low-power operation, as well as robust RF technology that limits interference. Its multi-channel, multi-protocol design helps ensure that gateway devices are not made obsolete by shifting protocol standards. Capabilities can be added with simple software upgrades. According to Cees Links, general manager of Qorvo’s Wireless Connectivity business unit - A new market report from Berg Insight states that 91 million homes in the EU and US will be smart by 2020. However, no analyst can predict today which networking standard will rule tomorrow. If design engineers want to keep their options open for future directions, they should choose a multi-protocol solution for their gateway. Qorvo’s platform uses OpenThread. This Nest Labs initiative aims to provide an open-source implementation for the Thread standard for smart home solutions. Qorvo’s Wireless Connectivity business is actively engaged as a contributor to the OpenThread community with the GP712 development platform. For more information about Qorvo solutions, click here.